Prepare to learn everything we still don't know about our strange and mysterious universe. Humanity's understanding of the physical world is full of gaps. Not tiny little gaps you can safely ignore -there are huge yawning voids in our basic notions of how the world works. 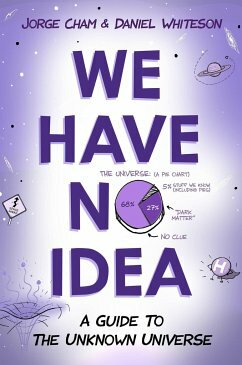 PHD Comics creator Jorge Cham and particle physicist Daniel Whiteson have teamed up to explore everything we don't know about the universe: the enormous holes in our knowledge of the cosmos. Armed with their popular infographics, cartoons, and unusually entertaining and lucid explanations of science, they give us the best answers currently available for a lot of questions that are still perplexing scientists, including: * Why does the universe have a speed limit? * Why aren't we all made of antimatter? * What (or who) is attacking Earth with tiny, superfast particles? * What is dark matter, and why does it keep ignoring us? It turns out the universe is full of weird things that don't make any sense. But Cham and Whiteson make a compelling case that the questions we can't answer are as interesting as the ones we can. This fully illustrated introduction to the biggest mysteries in physics also helpfully demystifies many complicated things we do know about, from quarks and neutrinos to gravitational waves and exploding black holes. With equal doses of humor and delight, Cham and Whiteson invite us to see the universe as a possibly boundless expanse of uncharted territory that's still ours to explore. Jorge Cham is the creator of the popular online comic Piled Higher and Deeper, also known as PHD Comics. He earned his PhD in robotics at Stanford. Daniel Whiteson is a professor of experimental particle physics at the University of California, Irvine, and a fellow of the American Physical Society. He conducts research using the Large Hadron Collider at CERN.